Sprawling Sandstone villa offers a front row seat to over twelve miles of beach, a private swimming pool, a gazebo, and water sports. Most of the Turtle Cove area has a strip of beach rock between the sand and the sea, but that’s not the case for Sandstone. It has a great, sandy beach big enough for all of your guests to stroll along! This spacious villa is ideal for family trips, a couples holiday, or weddings. Beautiful location right on the water! 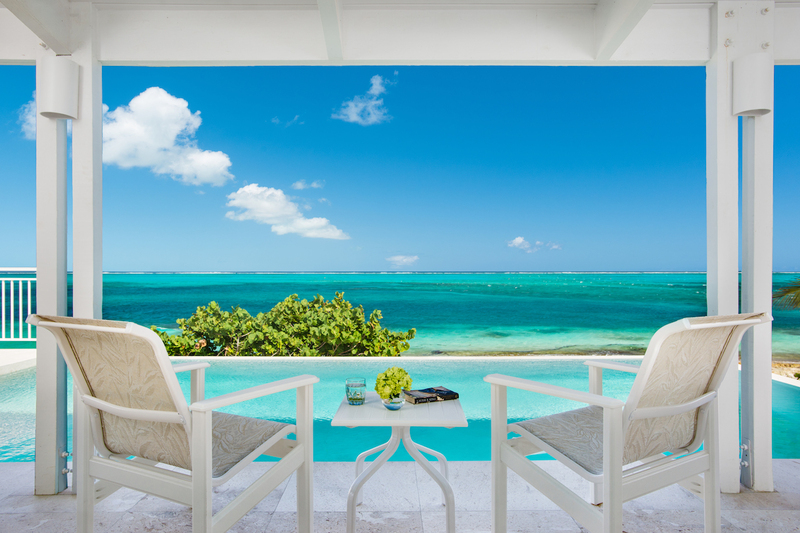 Beach Sandstone villa sits at the water’s edge of Grace Bay, a 12-mile beach with powder soft sand and crystal clear waters. This fully air-conditioned villa enjoys sunset views, an open design, and proximity to shops and water sports. Beach Sandstone is steps from the island’s best snorkeling spot, Smith’s Reef. This reef has a colorful coral garden overflowing with marine life, and non-diving guests can wade out from shore with a pair of goggles to catch a glimpse. Turtle Cove Marina is just across the street, and has water sport activities and maritime rentals for any group. Guests can relax in privacy around the villa’s infinity edge pool, on the spacious decks, or under the shaded veranda. The pool deck is on Sandstone’s upper level, and its elevated position only enhances the view. The dining area off to the side of the pool is shaded, so guests can enjoy breakfast, lunch, and dinner amongst the island breeze. The deck wraps around the entire upper level of the villa, so everyone can spread out to drink up the sun. Inside, the open-concept design encompasses the living, dining, and cooking spaces under one vaulted ceiling. The entire room has sea views and is fully furnished for optimal comfort. Guests can watch TV on the flatscreen in the living room, eat with an ocean view around the dining table, or cook on stainless steel appliances in the kitchen. All four of the villa’s bedrooms have a TV and views. The two king bedrooms are located on either side of the living room and have ocean views, pool access, and ensuite bathrooms. On the lower level, there are two queen bedrooms with ensuite bathrooms, garden views, and beach access. The beach level bedrooms have separate key-code entrances and can be accessed from the upper level by the exterior front steps. Beach Sandstone is minutes from Grace Bay’s restaurants, water sports, and attractions. The Grace Bay area has everything guests could need, from spas to an ER to a movie theater. Rates do not include: tax of 12%, island charges of $375. Beachfront on Grace Bay, which begins almost at your back door and extends for twelve uninterrupted miles. It is built almost at the waters edge, and Smith's Reef is just outside your door with terrific snorkeling even though a rocky strip exists between the sandy beach and the water immediately behind the villa. Car rental, private chef, butler, server, grocery and beverage shopping (pre-arrival and during your stay), liquor and wine delivery, nanny service, baby equipment, spa services, yoga and personal training, photography, and private airport transfer/car service can be arranged for an additional fee. Any A/C overage is an additional cost. Amazing house and vacation experience! We could not have asked for a better setting for our beach vacation. It was the perfect first visit to TCI. The house was just as described, if not better! We could have stayed right there all week and had a perfect vacation. There are several beautiful snorkeling areas right off the beach- which is steps from the house. The pool was a perfect cool down after the sand and ocean, and the huge covered porch was great to relax and get a break from the sun. Our family of 7 had more than enough room, we could have had another family with us and still had plenty of room. We will definitely rent from WhereToStay again. Andrew was prompt and friendly and gave us great tips for places to eat, things to do and best prices for rentals, etc. Thank you so much! The villa was incredible. It was a perfect fit for our family. We really enjoyed the kitchen, pool, and deck. Andrew and his team were very helpful with all food and activities. There was a lot of thought put into Andrew’s suggestions and they were spot on! Props to you Andrew! We will rent from your team again! Sandstone Villa was in the perfection location to be able to do everything we wanted to do. The snorkeling off of the beach was amazing! We saw barracuda, sea turtles and a huge variety of fish. The pool was perfect after a hot day at the beach. The villa is set up with 2 nice master bedrooms upstairs and 2 secondary lower bedrooms that do not interconnect, which is fine for older children. There is a shaded area outside to get out of the sun while still enjoying the beautiful views. We will definitely keep this villa on our list of places to stay. We have used several online booking agencies and WhereToStay.com is one we will definitely use again. Working with Andrew was a pleasure. We received very helpful information prior to our trip with activities, restaurants and villa info. A cell phone was provided for our use while there. Andrew was professional and pleasant, we will ask for him again!